If you have Lyme Disease or other tick-borne infections you know how quickly your health can deteriorate. For some it happens overnight after an initial tick-bite. For others, like myself, it can happen over the course of months as symptoms gradually appear and eventually debilitate you. The fight to restore your health will be much harder the longer infections are present and untreated. Here are some important things you can do to regain your health. The most important step when dealing with tick-borne diseases is to find a Lyme Literate MD or ND (Naturapath). Preferably find a doctor trained or educated through ILADS but at the very least someone who believes that chronic Lyme exists, knows about co-infections and understands the complexities of tick-borne infections. A quick way to know if you have the right doctor is to ask them if they follow CDC guidelines for diagnosing and treating tick-borne infections. If they do you will most likely be misdiagnosed and improperly treated. A LLMD will help you address areas of your health that could prevent you from getting well such as mold exposure, heavy metal toxicity and candida. Many people with tick-borne infections lose their cognitive abilities which makes reading and comprehending almost impossible. If you find this is a problem for you, find an advocate, someone who can help you make sense of what you’re going through. Take them with you to your doctor’s visits so they can take notes and ask questions for you. You cannot heal from a chronic disease without making changes in your life. If your diet is poor your body will not heal. If you’re drinking or smoking you are compromising your health and will not heal. Eliminate stress, simplify your life, eat healthy and get plenty of rest. You may be too weak or fatigued to exercise but try to at least do some gentle stretching and when you’re able add in a reasonable exercise program. 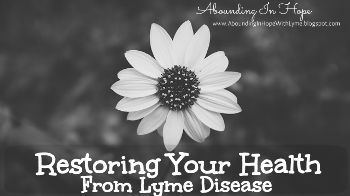 In the Lyme Disease community many are severely ill. All of us are desperate to do, try and buy anything that may help alleviate the pain and the debilitating symptoms. In my 6 plus years of treatment for myself and my family, I’ve realized that slow and steady truly does win the race. Use wisdom when choosing a treatment protocol, do your own research, consult with your doctor and ask what other Lymies are doing. Remember though, no two Lymies are the same. There are many complicated reasons why we each respond differently to the same protocol. Your doctor should be able to help you wade through the many legitimate options. Everyone needs a friend but those who are chronically ill really need a good support system. The burden of caring for and encouraging someone who is always sick can be too much for our loved ones and close friends. Give your caregiver permission to take breaks. Find a support group where you can open up and share about what you’re going through. It’s important to be heard and understood. Something very healing happens when you find out that you’re not the only one having those horrible symptoms especially when many of us have been told that our symptoms are all in our head or that they are just stress related. We can help our loved ones understand us by sharing with them what our struggles are and telling them how they can best help. When pain is your life, it’s easy to fall into discouragement and give up hope. Having tick-borne diseases can be a very long and emotional battle. I know all too well that discouragement. I’m a Lyme sufferer, my husband and children are as well. It’s always a struggle and if we’re not all feeling terrible, there’s always someone here who is. Don’t give up! Find a reason to live and to fight for your health. Find a reason to hope again.If you need help, please call the Suicide Prevention Lifeline. Get help right away. It’s worth it. *** Since writing this post, our family has come out on the other side of Lyme disease. You really can be a Lyme Thriver. Keep up the good fight and don’t lose hope!